It always boosts me to see Huw’s friends and particularly how much they care about him and that they want to remember him in a positive way. It was lovely to see everyone on Huw’s 17th birthday at a place on the beautiful hillside where he had a lot of fun in recent years. A big thank you to everyone who helped with the balloon release and especially to Heather and Ella who organised it so well. 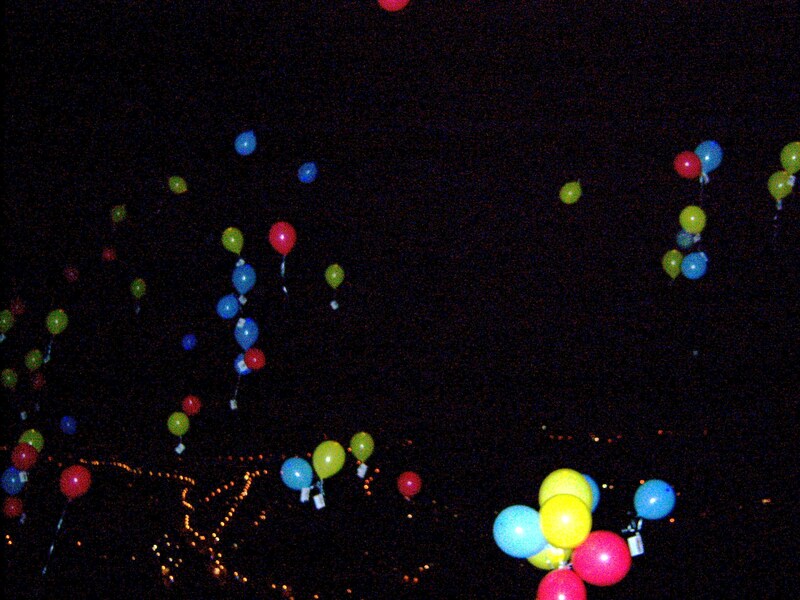 It meant so much to see the balloons and messages floating into the sky. Nearly 100 people where there because of Huw ♥♥♥. It was lovely to be able to give out homemade flapjacks (which tasted surprisingly nice) and to give Huw’s friends some photos and wrist bands. It was particularly good to see James Charlesworth and everyone is sending the big man love and good wishes. The words below apply to Huw – and also to the feeling of care and love shown to Huw by ALL his family and friends – those who were there tonight as well as those who weren’t. Huw’s birthday was a time he really looked forward to and that we always kept special for Huw. Talk of Christmas in our household, always waited until Huw had celebrated his birthday – having fun with his family and friends. This year the same family and friends are remembering his birthday with just the same love and care. Here is a picture of Huw on his first birthday and one of him around the time of his 15th birthday. They say time dulls the edges of grief, but nothing blunts the sharp edges of what happened to Huw. Sometimes people need to move on from losing a loved one. You are too important for that Huw. You are a loss that we need to never forget. It is possible to lead positive lives, still possible to love Huw and others, and to enjoy the company of others. It is still possible to gain pleasure from special moments and special people – the hundreds of people who were special to Huw – Carys, the rest of his family – and his amazing friends. I am privileged that many of the people who were so special to Huw are part of my life, especially those from his age group. And so many of the relationships we enjoy with Huw’s friends and family are driven by what Huw meant to us. This, along with everything that is done for the Huw Thatcher Trust is a lasting and positive reflection of Huw. Huw, there is so much to be proud of in honour of you. And that’s because you deserve it………..and because the sharp edge of losing you as you were entering the prime of your life………will never dull. People talk about those we have lost having ‘travelled through the journey of their lives’. We’re all so sorry Huw that you had only just started out on your journey – although for every step of it you were happy, and we were proud – and still are. Memories come to mind all the time, mixed with all kinds of emotions, and as time passes we appreciate them more and more. Remembering what Huw means to us, can keep us on a positive path and remind us that life is often too short and that we can appreciate more than ever those who are close to us. As these memories come to mind I often imagine if somebody said ‘what would you have changed about Huw’s personality, what he means, and what he did in his life?’ The answer is always ‘nothing’ – there is absolutely nothing I would want to change about Huw as a person. Huw’s friends and family remembered Huw in their own ways on his birthday – whether it was lighting a candle, arranging flowers, letting off balloons, or just thinking about what a lovely, happy, balanced, handsome, creative, sporty, smart, caring and popular guy he was. Thank you to everyone who is so respectful about Huw and his life and so supportive of his memory through the Huw Thatcher Trust or however they go about respecting and remembering his happy life.